I am cut from the fabric of my grandmother, wild and crazy, spirited and dangerous. Unpredictable women we are, the kinds of women they send to sanitariums. Women who fall apart. Women who must take pills to be good mothers, who must fold our pretty legs under our skirts rather than slip them into leotards for dancing. Women like my grandmother and me, we love to dance. I grew up hearing the story of how my grandmother left my young mother in a burning car and ran away for help. I grew up hearing that she was irresponsible, didn’t cook, was never around, not a mother. How she would fill herself on samples from the grocery store but never buy anything, her long lacquered nails plucking morsel after morsel. She answered the front door wearing only her stockings and brassiere. I thought she was glamorous. I’d seen other grandmothers like mine. With puffed up curls, coffee-colored eyebrows more paint than hair, grey roots shining from under their hairlines like a fallen hem. Beautiful women, grown larger with years, having lost their waistlines. That’s what she said, that she’d lost her waistline. Don’t let it happen to you, she warned, before I ever had a waistline. I remember childhood crying fits at night in bed. My mother coming in, how she perched on the edge of my bed, her hand rubbing nervous circles on my back. My body shaking in heaves I couldn’t stop. Worry in her voice, sometimes we just need to cry for no reason. I think I had reasons. A fire burned inside me, hot coals in a clench of skin and muscle. It was nothing I could figure out how to say. In my dream we are schoolgirls together, laughing in the courtyard, smoking cigarettes in the woods, skinny-dipping in the river. We roll our skirts up and our stockings down. We trim each other’s hair to pageboys, smack bright red lips to each other checking for an even kiss mark. We lie in the dirt and dry grass under a hot southern sky and sleep, straw hats on our faces, legs overlapping. My grandmother was, as her children say, so aloof and excitable, so wacky and unreliable, perhaps she was unable to be a friend. I don’t want to think of her that way. I want to think of us together as teenagers. Growing to be young women together, confiding in each other our doubts and sorrows and wild panic, and helping each other not abandon our children. I want us to be friends who wet-nurse each other’s babies so that some days each of us can go wander a river, or stumble home from a party, or howl privately to the sky. We could have allowed each other to feel childless for long hours of the day, to feel pretty again and youthful, to remember desire. I would have been at the births of my uncles, my mother, my aunt, I would have held her hand and looked deep into the scattered brown of her darkening eyes and said, Yes, you can leave. Yes, you can go when the baby comes, I’ll take care of it for you, you can go. And because I said it, because I gave her the open door, she would have stayed. And when my child was young and I awoke in the cold horror of a nightmare—a stampede of animals turned my son to dust while I applied lipstick in a mirror—she would have been there to pet my hair and dry my cheeks with the sides of her hands and laugh, Girl, you know you wish it and at the same time you don’t. It’s alright, we all do. You love him to death, that’s all it means. If I’d had her there to say it again when I was often so worried I might leave the baby on the counter of the fabric store and step out into the city, carefree and light, strolling the streets, peering in windows and wondering at the world, the baby more forgotten than a button that popped off my coat. She would have brushed my fears away, easy as lint. Alone in my bedroom, a small girl, shuffling a halo into the green carpet, my hands clamped over my ears, my eyes pressed shut. A frenzied panic in my chest. It started soft like a dozen or more radio stations clicking on, a low murmur. A jumble of sounds and overlapping voices getting louder, reporters relaying news of bombs and wars and death tolls, numbers rising. I couldn’t make it stop. Just had to wait it out, five minutes, ten minutes, twenty. Shut out the light and as much of the sounds as I could, clenched. Around and around the room. Who could I tell? My mother couldn’t understand. Already, her frequent looks of concern slanting through me. The nerves reigned in her grip. All the yelling and slammed doors. Rug burn on my shins from scrambling up the carpeted stairs too fast, just to be alone in my room. In picture albums, my mother is a brunette Shirley Temple with scabby knees and a gleaming toothpaste smile. Then, an adolescent as lovely as a swan, thin-necked, sweetly smiling, her tiny poodle skirt like an over-turned martini glass. In high school she is pretty in that perfect girl-next-door kind of way, short in stature, feminine, a brown bouffant, just a touch of eyeliner, lip gloss, a good girl. We would’ve run in different crowds if we were classmates. She, in sync with the cheerleaders, in uniform, belonging; me with the artists, in our tattered vintage clothes and unkempt hair, dreaming of a way out. As a teenager I did not look in the mirror. I only did it if I had a purpose, but never for the sake of admiration. I was told I was pretty like my grandmother, but I did not allow the compliment to stand. I knocked it down and never looked long enough to form my own opinion—afraid it wasn’t true. Afraid it was. I’ve seen pictures of my grandmother in a sequin leotard, in a line of women, elbows locked like paper dolls, dark-lips, arched smiles, one leg bent, one leg lifted, all in sync. My legs are shaped like hers. If my grandmother and I had been young together we would have been like sisters—best friends, accomplices to each other’s silly crimes. We would have grown up together and then stayed together, moving to the same block, a strip of fence between our houses. We’d have made our husbands tear the fence down so there was nothing between us. We would have smoked cigarettes over black coffee and a fallen cherry pie and bitched about the neighbors’ triumphant cakes and their children’s spotless rompers, the women we knew unlike us—we, who prefer to read Sylvia Plath or jam a fistful of wildflowers into an old bottle, rather than slip rubber gloves into a sink of bubbles or mop the floor. We don’t bleach anything clean. We don’t iron any man’s pants. Our bathrooms are draped with our stockings just rinsed. We let our children run wild and cook one monstrous dinner for all of us to last as long as it can, so that in the evenings we can slouch in an armchair with a book in hand, or lay on the rug, legs swaying to a record spinning on the stereo. All summer we eat wild strawberries, licking the red stains from our fingerprints, and shoo away mosquitos from our bare legs. Winter evenings we bundle into matching scarves and walk hand-in-hand well past the first stamp of the moon, until we are surrounded by nothing but blackness and the smallest pricks of light that remind us somehow that we are not lost. And when we lose ourselves, we help each other stay safe. We take each other’s children and mother them as best we can until the other is well enough to come stand in the house again. And when she surfaces, we bend a fence around the other, to protect the fragile cracks while healing. Keep the men out, the children away, bring each other carefully back out to the starlight. My grandmother, my love, I’m talking to you. I came to you when my son was just a baby, do you remember? We saw you in the hospital and I bounced him on your bed and I told you all about him. I showed you each of his dimples and patted his fat hand to yours. I told you of his first words and his squinty smiles and the way his hand grasped for me in his sleep. We came all that way to say goodbye, did you know? In your apartment we found your jewelry, all the bracelets I mailed you from New York City street vendors, plastic turquoise and mother-of-pearl. We gave away your aqua spiked heels, the ones you wore all the time with over-sized sweaters and leggings, showing off your shapely legs. I wish I had them now. I would have liked to have borrowed them, now that I’m a woman. My grandmother, you have not known me as a woman. True, I was a mother when you died, but I was girlish, I was fighting forward with my eyes closed, I had not yet seen my own body in the mirror, had not stepped into the caste of my widened skin. The woman I would become hung around me like a ghost then. I was using the word mother for myself, tentatively, and I would not call myself woman. A girl. What is in a girl that is lost in a woman? Seated at her vanity, my mother, tucked in a towel, leaning close-in to the mirror, blow-drying her hair, spritzing hairspray, brushing her face with powder, lining her lips a sharp pink and coloring them in, dabbing at the quilted pillow of eye-shadow, a swipe of rouge, not too much, a touch of Shalimar to the wrist. Weddings, bar mitzvahs, services, dinners, funerals, over and over, layer upon layer. The same ritual since her dates and proms and cheerleading games and sorority parties. Through the crack in the door I watched her make herself into someone I did not want to be. What does it take to be a woman? What does it take from you? My grandmother and I are the kinds of women who retain a certain girlishness as we age, coy and flirty, we thrive on admiration, we stumble through our schedules, cannot maintain routines. Always changing, we are like kaleidoscopic colors. Did she see it in me, I wonder, that same patterning, that wild impulse that leapt a generation and settled into me, linking us in a slip stitch. Granddaughter. Grandmother. When you were my age now, grandmother, you were just out of the hospital and fragile still. Your long fingers pulled stems from tall black buckets at your job at the flower shop. I can see your eyes squint, lips frown, while you arrange a bouquet in a vase. Your painted nails pinch off the rose thorns. A ruffle of petals. The plucking of leaves. This one for a funeral. This one for a thank you gift. This one for a girl in the hospital. What song plays in your mind while you hum? Do you think about the doctors, the white bed, the pills and machines? Do you remember how you were lost to your children? I don’t want to follow you there. This is a story that changes in my hands. In the house, when my son comes to me, I wrap my arms around him. His head smells like wet sand and eiderdown. His fingers tap upon the stacked bones of my neck. That is the only sound in the room. His hands are beautiful. His feet are free. When our embrace is over I’ll cook him breakfast and we’ll walk to the market, the bookstore, and then we’ll come home. Grandmother, I remember the smell of you, rose water and powder, the perfume that drifted onto my shoulders. The black curly mess of your hair. Liquid brown eyes. Dark. Rimmed in black pencil. The southern twang that whistled through your orange smeared lips. Your hands, browned by the sun, thick-knuckled like mine. Too many gestures. Fingers quick as birds. A jumbled of creases in the palm. We called you Nana. You live in me now more than before. Nana. In my dreams you are whole. I see us as girls together, scrappy and mischievous in dirt-covered dresses. Playing toy soldiers and tin flutes in the dusty yard. Southern girls, girls who know to look down in public and look up in private, we were those girls. Turn your back to me so that I can button your dress, slip the slim pearly shells into the tight little mouths that dot a line along your spine. Let me help you put yourself together, gather yourself. Turn around, let’s see your lips, give them one nice press and there you are. Let us go back to the car—that car that burns eternal behind my mother’s round eyes—there is smoke, the heat is pulsing off the asphalt, the door handle is right there gleaming. Open it. Get the child. Get her out. Take her hand and I have your hand and together we run. Liz Fischer Greenhill is a visual artist, a poet, and a nonfiction writer. 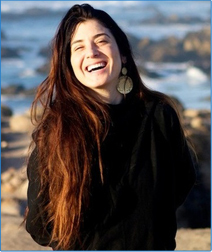 She is also an acupuncturist who practices hands-on healthcare in Portland, Oregon. Liz’s work has been published in The Rumpus, Gertrude Press, Nailed Magazine, The Collagist, Perceptions, Four and Twenty, Oregon East, The Dream Closet, and the poetry anthology Step Lightly. Her work is forthcoming in The Untold Gaze, a book of writing paired with the paintings of Stephen O’Donnell. Her 16 mm animated short, “The Loveseat,” showed in LGBTQ film festivals across the US and in Canada. 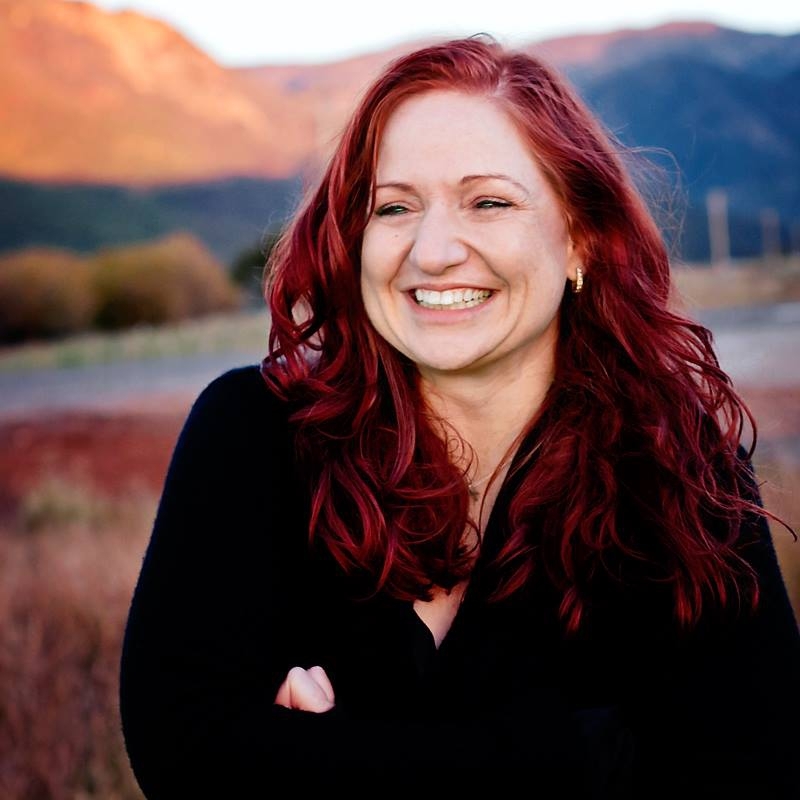 Currently an MFA candidate at Eastern Oregon University in Creative Nonfiction with Lidia Yuknavitch, Liz is working on her first book.